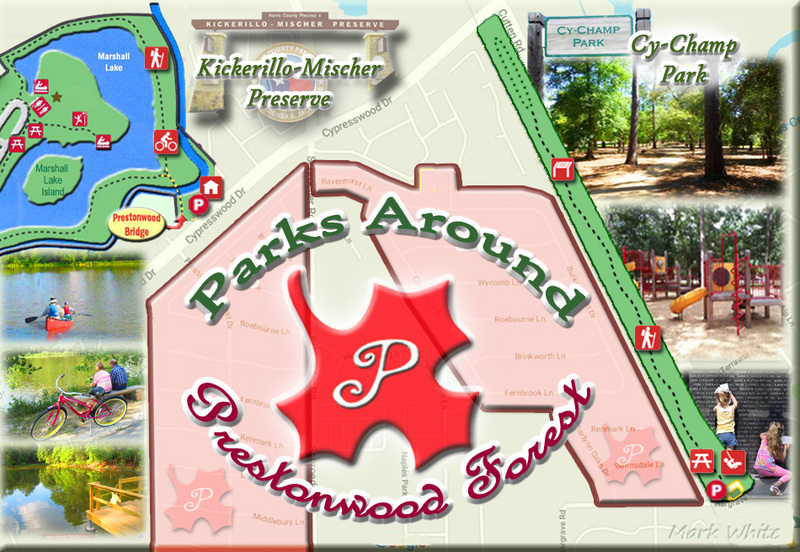 Several unique parks are conveniently located to Prestonwood Forest and offer a variety of family activities! The Cy-Champ Park offers trails ideal for hiking and jogging, along with a children’s playground. This park is also the home of the Fallen Warrior Memorial. The Kickerillo-Mischer Preserve is the ideal destination for a wide array of land and water activities . 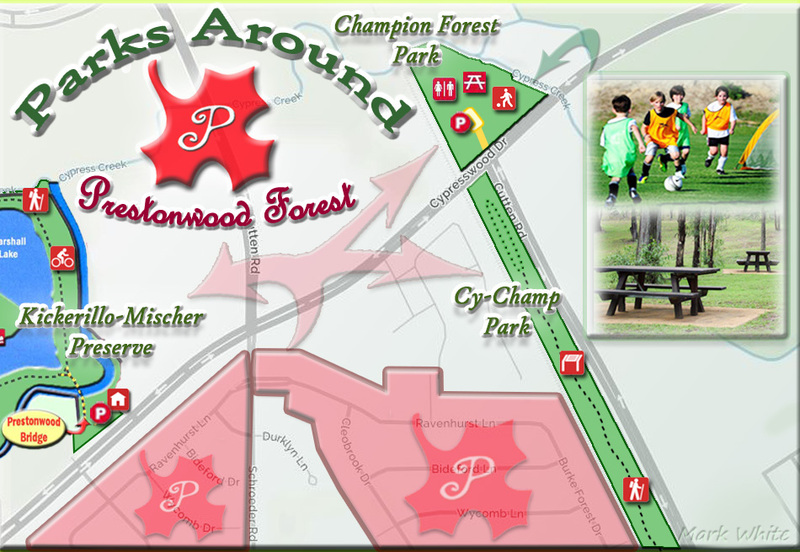 The Champion Forest Park, currently in development, will offer practice soccer fields, a playground, parking lot, picnic area, trail and restrooms. This new park is located north of the Cutten Road and Cypresswood Drive intersection. More information on Precinct 4 Parks and Activities is available at www.hcp4.net/parks. Cy-Champ Park is located along Cutten Road with the park’s entrance and parking from Hargrave Road. This long narrow park features a 1.5 mile linear nature trail, with a loop on each end, which is ideal for jogging and casual strolling. The trail includes distance markers and weaves through the woods for welcome shade. For additional family enjoyment, Cy-Champ Park offers a children’s playground at the park’s entrance. Water fountains are available, but no restrooms. Cy-Champ Park is also the home of the ‘Fallen Warrior Memorial’, which is located near the end of the park’s nature path. This memorial honors the sacrifices of our brave men and women from Texas, who gave their lives so that we may enjoy our freedoms. The four large granite walls are engraved with their names in remembrance and as a reminder of their families and friends who have suffered their loss. More information on the memorial can be found at www.fallenwarriorstexas.org. 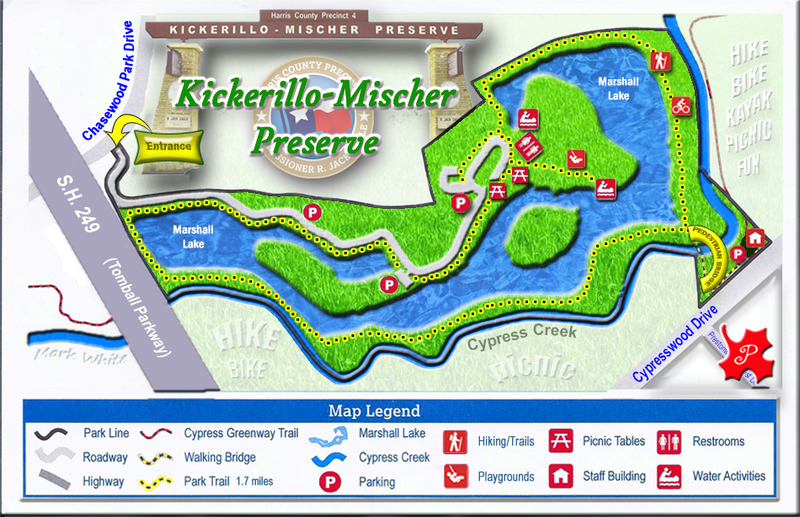 Precinct 4’s Kickerillo-Mischer Preserve, which opened April 1, 2017, is an 80-acre property, including Marshall Lake. The Preserve is ideal for hiking, bicycling, kayaking, fishing, and picnics - and is easily accessible from Prestonwood Forest using the pedestrian bridge on Cypresswood Drive. Limited parking, near the bridge, is also available during the Preserve’s posted hours of operation. For more information about the Kickerillo-Mischer Preserve and Precinct 4 ‘Trails and Parks’ (TAP) Recreational Activities, please visit the Precinct 4 website: http://www.hcp4.net/kmp. Under ‘Events and Programs’ you will find a Monthly Calendar of great family activities and workshops at the Preserve - don’t miss out! Slated to open in the fourth quarter of 2018, Champion Forest Park is a seven-acre property, located north of Cypresswood Drive at Cutten Road. The park features four youth soccer fields, six concrete picnic tables, a small playground, walking trail, and a restroom facility - an amenity for visitors to Champion Forest Park and the nearby Cy Champ Park walking trail. Precinct 4 plans to add a trail connection from Champion Forest Park to the Cypress Creek Greenway, giving residents trail access to Kickerillo-Mischer Preserve and Matzke Park.